Amazon Alexa has been growing leaps and bounds over the last 2 years. Amazon’s Alexa voice platform has now passed 15,000 skills — the voice-powered apps that run on devices like the Echo speaker, Echo Dot, newer Echo Show and others. The challenge in creating new skills is to ensure that the data is dynamic, correct and up to date. Here at StarfishMint we have analysed ways of ensuring that our data is dynamic and fresh. We are doing this by screen scraping websites and using an algorithm to retrieve multiple versions of the results and then choosing the one that we believe best suits the question. To be able to search the internet and retrieve the best possible results, we are using the Microsoft Azure – Bing Web Search API. This API allows us to bring intelligent search to our skills and to harness the ability to search through billions of webpages, images, videos and news with a single API call. StarfishMint already has 2 skills on the market, where this has been achieved!! This is a great recipe skill, which uses already available recipes on the web. Starfish Food fetches internet results for your recipe searches powered by Bing search api, we troll through comprehensive list of website to get the best result for your recipe search and dynamically generate content from website text. We also email the final recipe you decide to cook to your Starfish email account. Also the skill is optimized for Echo show so you get good visual display of what you are cooking. 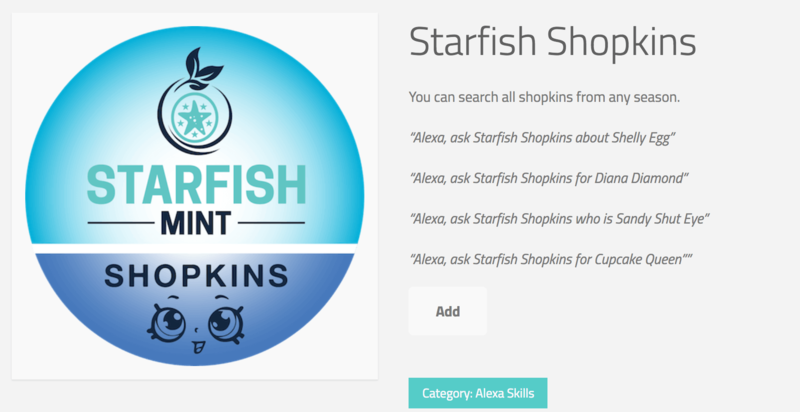 Starfish Shopkins fetches internet results for your shopkin searches powered by Bing search api, we troll through comprehensive list of website to get the best result for your shopkins search and dynamically generate content from website text. You can ask about any shopkins from any season and we will try and get the best definition and details about that shopkin from the internet. Both Starfish skills are available in several countries including, Australia, Canada, UK, India and USA. Both of these skills shows us how we can reuse website data, which means you create your content once and if you have structured data then we at StarfishMint can lift information from your website and turn it into a skill. If this is something that interests you and you would like help in creating your own personalised skill, then please contact us! !